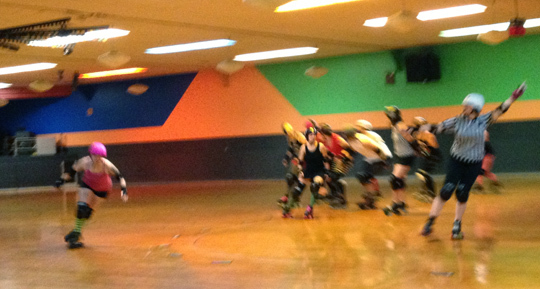 On Saturday evening of our Ottawa trip we headed to the bout. Although we played the Slaughter Daughters in 2009, there wasn't much we knew about them. Internet research revealed that the Slaughter Daughters were the 2011 Champions of the Canadian roller derby tournament Beast of the East. 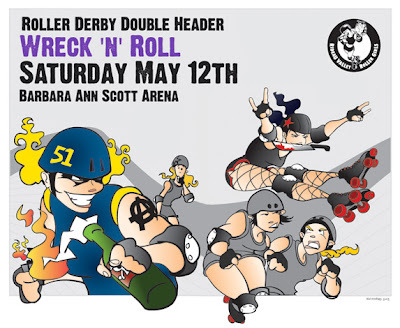 It also surfaced that two of their skaters, Semi Precious and Soul Rekker, were on Team Canada for the 2011 Roller Derby World Cup. WHOA. 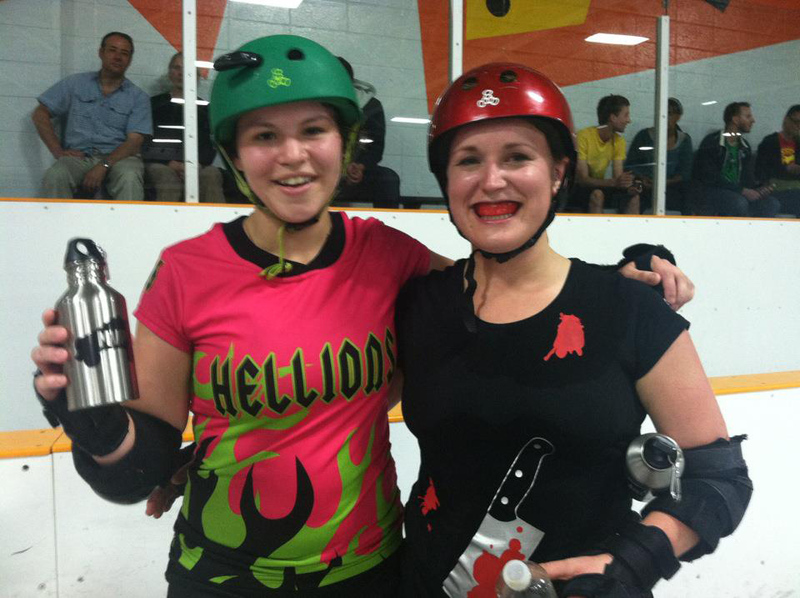 The Slaughter Daughters are part of Rideau Valley Roller Girls. Our first few jams seemed to go well, but soon the Slaughter Daughters were able to take advantage of a big power jam. They had really good team work and their jammers were also very smart. It was still fun to play them. We were familiar with a lot of their strategy, but they were very adept at implementing it. I loved watching Knockout block Soul Rekker - they are both so good! At one point when I was out blocking and KO was jamming, I saw her land a crazy apex jump. Speaking of, Knockout earned MVP for this bout, along with Semi Precious. 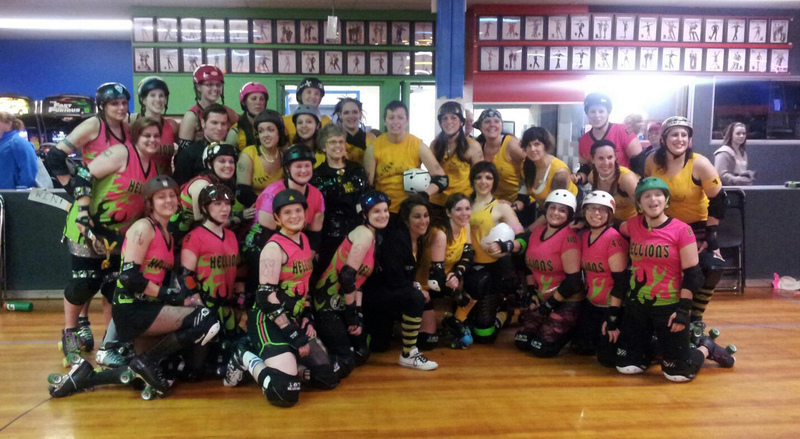 The final score was Slaughter Daughters (Rideau Valley Roller Girls): 241 - Hellions of Troy: 74. I do want to point out that I was said we didn't sing the national anthems before this bout. I've been to Canada/seen enough international bouts that I know most of the words! 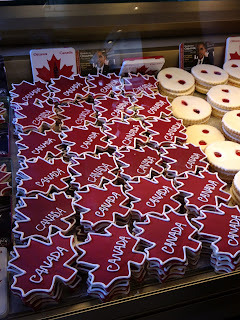 Here is a link to a youtube video of O Canada: http://www.youtube.com/watch?v=zwDvF0NtgdU to make up for it. During practice last week we had the opportunity to introduce some of our new girls to the basics of scrimmaging. They've been working on stops, falls, and basic hits .... so we thought it might be fun to throw them into some real action! Their WFTDA minimum skills test is also coming up soon! + If you get knocked out, come in behind the person who hit you out so you don't get a cut. + Work with a partner. + Stay on the line. + Watch for the jammers! 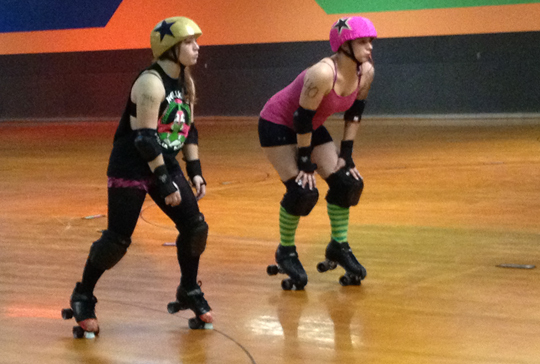 Cricket and June Bug lined up to jam - first time ever! 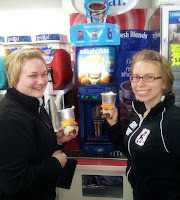 On our team we also moved June Bug from the inside line to working in the middle. At one point, we had them both jam! Here they are lined up on the jammer line. They actually both jammed a couple times and each got lead jammer at least once. I saw Cricket jump right over a downed skater and it was awesome! 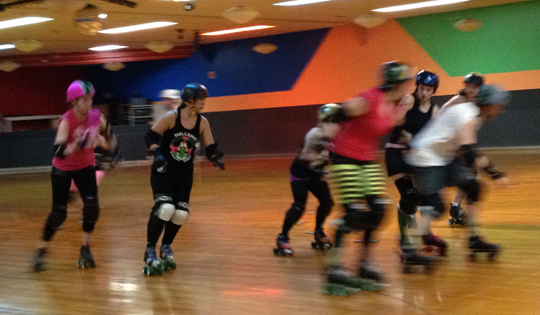 June Bug - Lead Jammer!! Cricket looks to take the inside line to race ahead of the pack! When you practice jumping as a freshmeat, it can be awkward because you're not really jumping out of necessity, you're just jumping over 3 inch orange cones to prove you can do it. We don't always practice jumping at the same speeds we actually play at. So I was very impressed when the time came to jump over a whole person (a lot bigger than a little 3 inch cone), she did it without a doubt. We were all like "YAYYYYYYYYYY that was awesome" and she just looked at us with a "what did I even just do?" This actually happened to me during my first bout. That's one of the best parts of your first scrimmage. You don't even know how good you are and we can barely express how proud and impressed we are by all your hard work. *the theme of this quarter's fresh meat class is "edible insects" and includes other names such as 'Centipede' and 'Locust'. 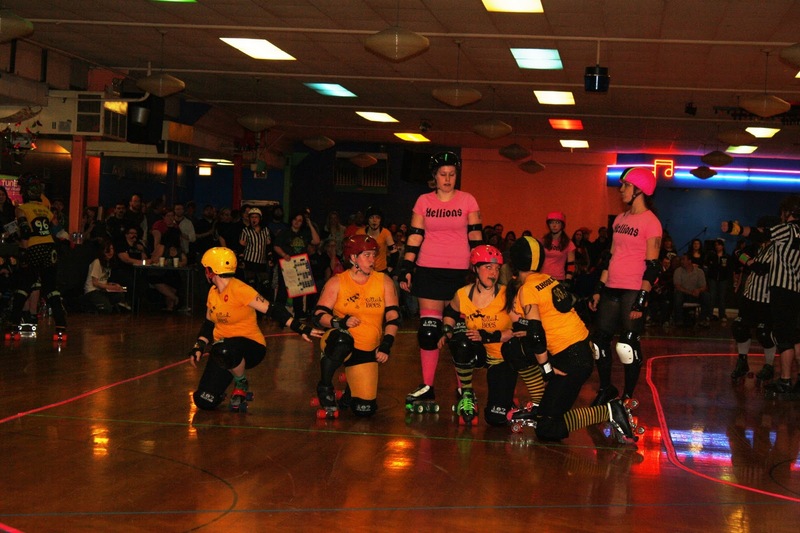 Hellions vs Killah Bees in 2011. On Saturday, April 28 we hosted the Killah Bees of Providence Roller Derby. We first met the Bees last year in one of our only bouts which we suffered a loss in 2011. 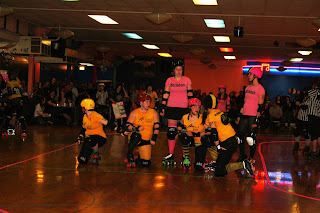 It was actually our greatest defeat of 2011 - a final score of Bees 211 - Hellions 59. They were the first team we faced that consistently employed the strategy of taking a knee at the jammer line. If implemented properly, this strategy immediately starts jam, releasing the jammers as soon as the refs are able to blow their whistles. We were excited to host the Bees again to see how we would fair. The beginning of the game was tough. The Bees opened up with a huge 24-0 jam. We didn't score for the first five jams, until Pork Slap took 8 points in jam 6. We were getting our groove, but by the end of the first period, we were down 62-112. In the locker room, we talked about their strategy and what we needed to do to react. We recognized their tactics and discussed counter-strategy. We knew it would take teamwork. Our refocusing at halftime worked. We inched up in points. Five jams into period two, Shockratease had an amazing 25 point power jam, which closed the gap even further. It was so exciting! Soon, after a couple strong jams from Pork Slap and Shockratease again, we finally took the lead. We were so close to sweet victory, but the Bees weren't ready to give up. A 20 point power jam for the Bees gave them back the lead, and they refused to give it up again. The last 5 minutes of the bout were very exciting as both teams fought for points. In the end, the Killah Bees won the bout with a score of 177 Bees - 169 HoT. Only 8 points! In roller derby, that's practically a tie! Not bad after losing to them by over 150 points last year. It was one of our best games so far this year. Thank you Bees for the amazing game! 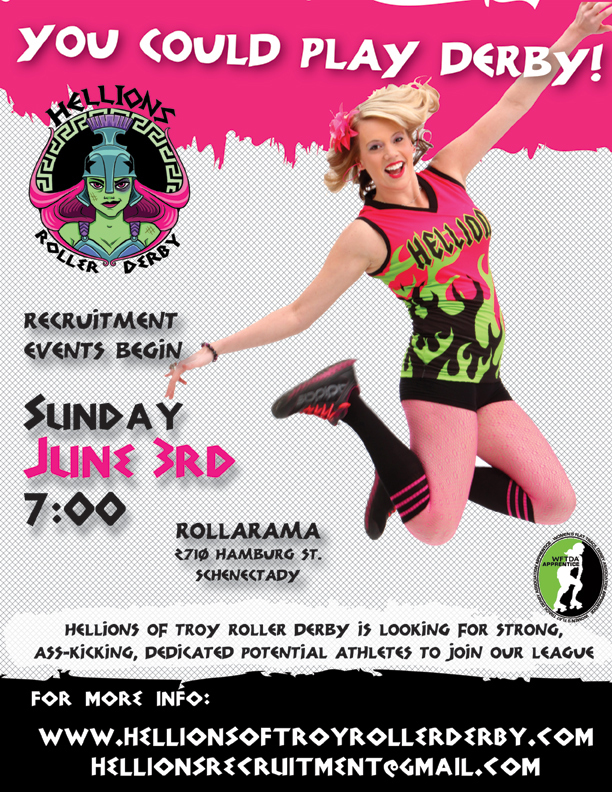 Do you have what it takes to be a Hellion? The weekend of May 12 the Hellions took a jaunt up to Ottawa, Canada. Most of us made the 6 hour drive on Friday evening, getting in late but ready to greet adventure on Saturday. I drove up with Massacre, Haidee, and Kitty. We stayed in an Ottawa Hotel with several other Hellions, which was actually part hotel, part senior living apartments. 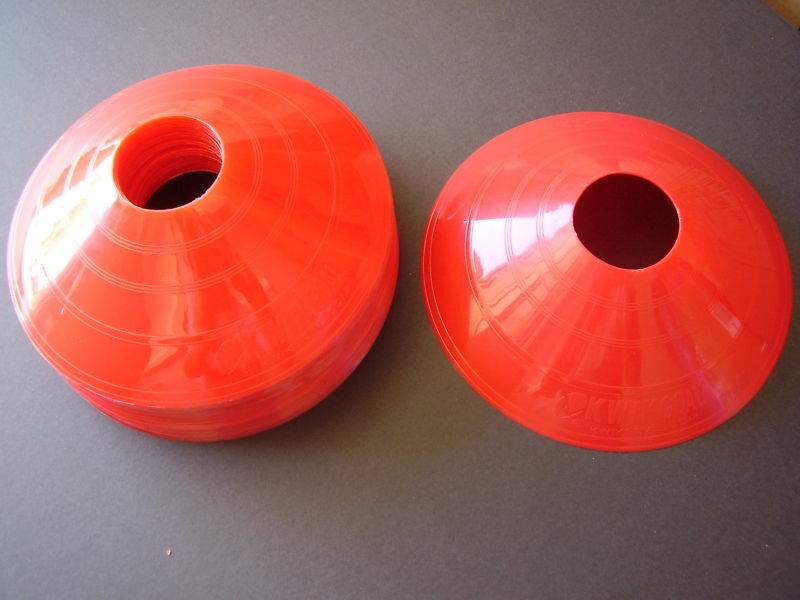 We deemed it the Old-tel. Imagine parading through a hotel lobby in fishnets and gear bags, walking pass older folks just biding their time. I wish I had thought to hand them a flyer. 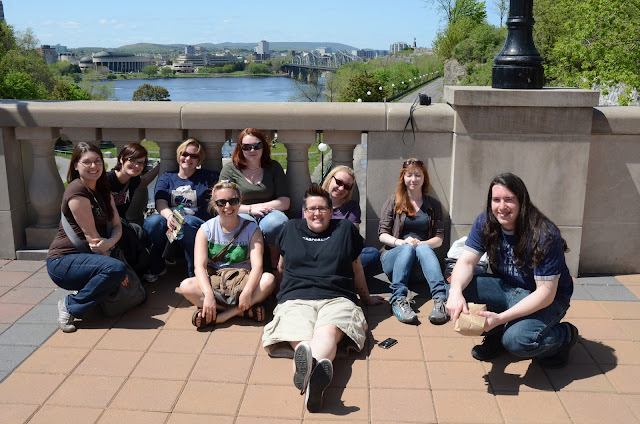 Ottawa was a really nice city. 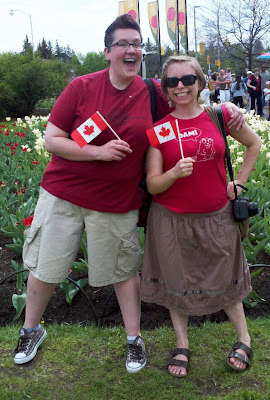 On Saturday we headed to the Capital Hill area for brunch and to check out their Victoria Day / Tulip Festival. 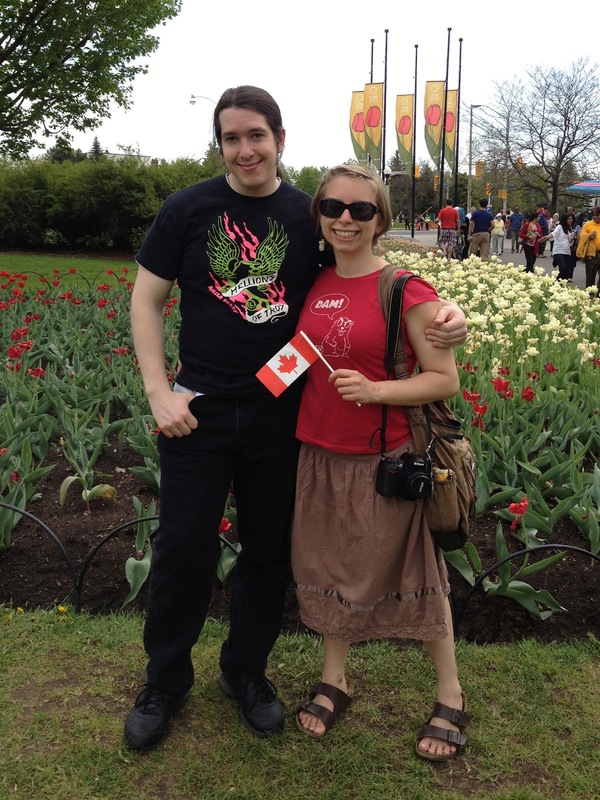 Even though we missed Albany's TulipFest, we still got to check out tulips in Ottawa! 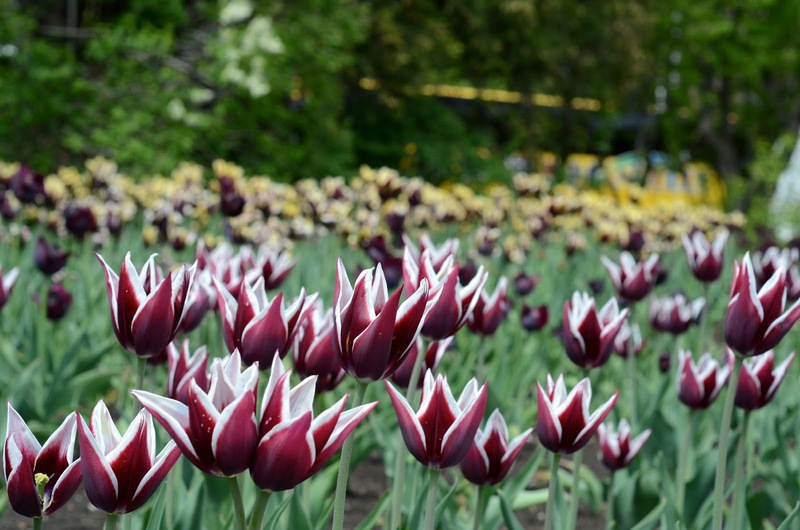 But, like Albany, the flowers were mostly past their prime. It was also Tulip Fest in Ottawa this weekend. 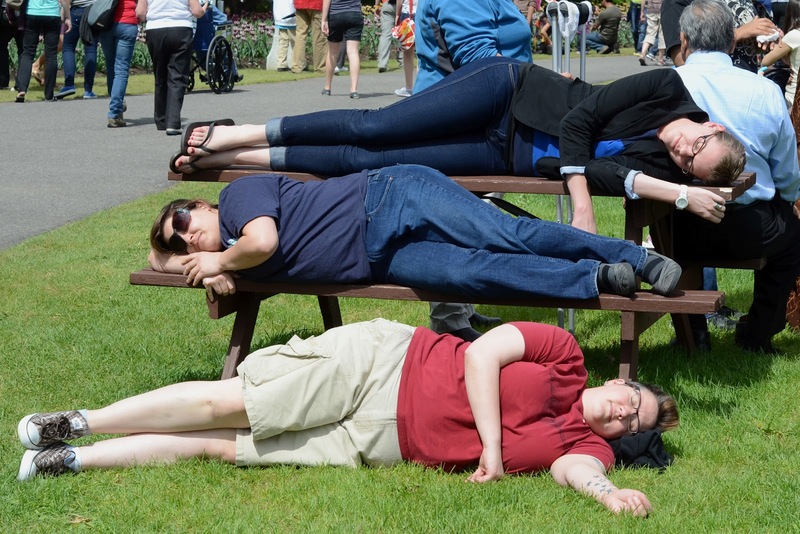 Lehman, Val, and Eloda simulating a triple bunkbed on a picnic table in the park. I don't know why. Massacre and I in the park. Eloda and I in the park. Notice our matching outfits. 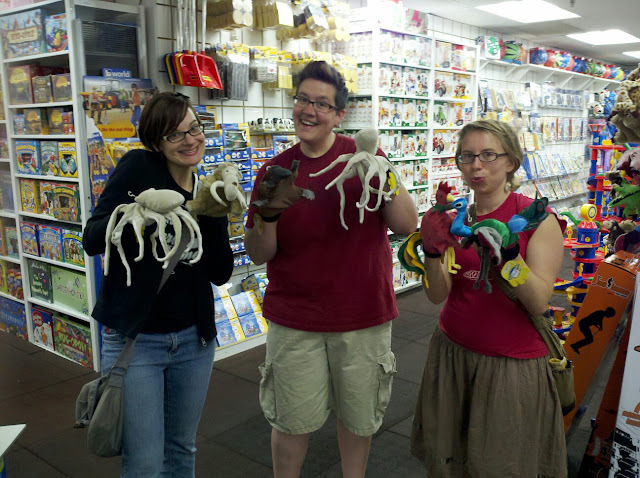 Shock, Eloda, and I in a toy store. I walked up to them having a puppet conversation that was in barely-discernable english, but they looked like they were enjoying themselves. So I put a bird on it. On Sunday we were able to enjoy some more of the city before heading out. 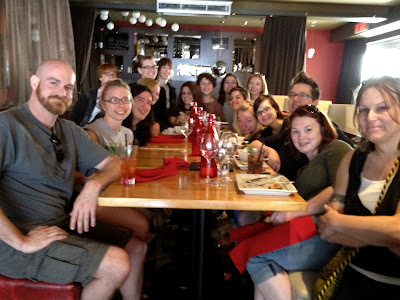 Some of the people staying in the Old-tel got breakfast at a restaurant called STeaK. 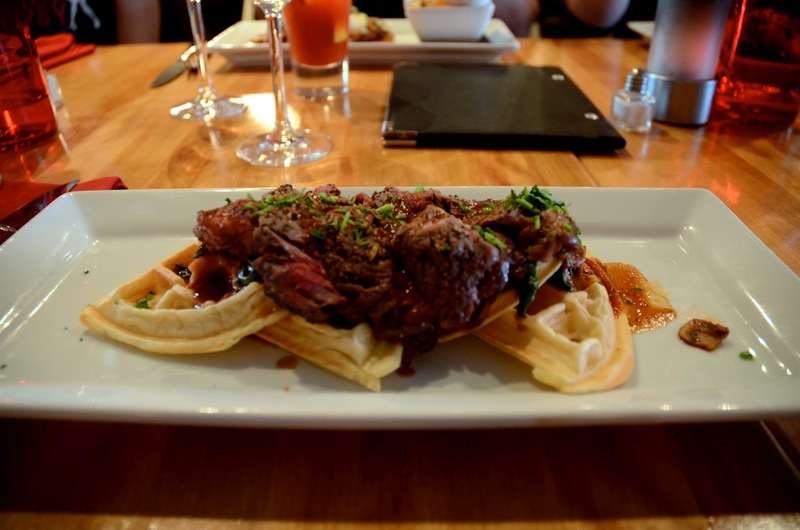 I had waffles with steak -- two of my favorite foods TOGETHER. I'm no food blogger, but I will say it was excellent. Next we ventured into a market area. 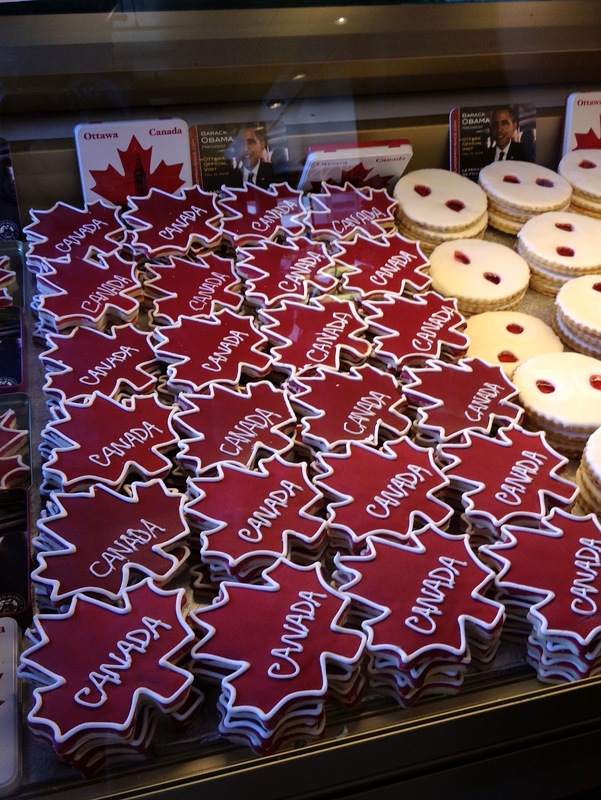 We found a sweet bakery with Canada cookies. There was also a market area with lots of art, jewelry, vegetables, and all that. After that we found the Parliament building area. 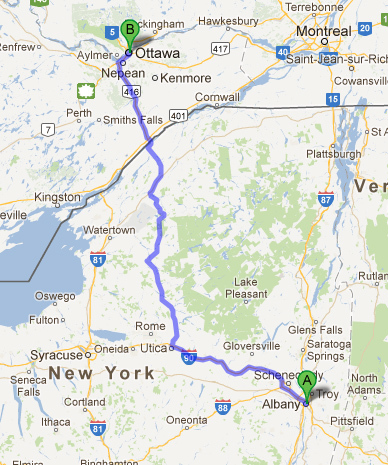 I think Ottawa is a bit like Albany in that it's a capital city. The parliament buildings were spread out over a vast lawn with lots of people congregating. Prime for taking pictures, of course. Kitty doing a cartwheel on the lawn of the Parliament buildings. Yay Ottawa! Yay Hellions family vacation!